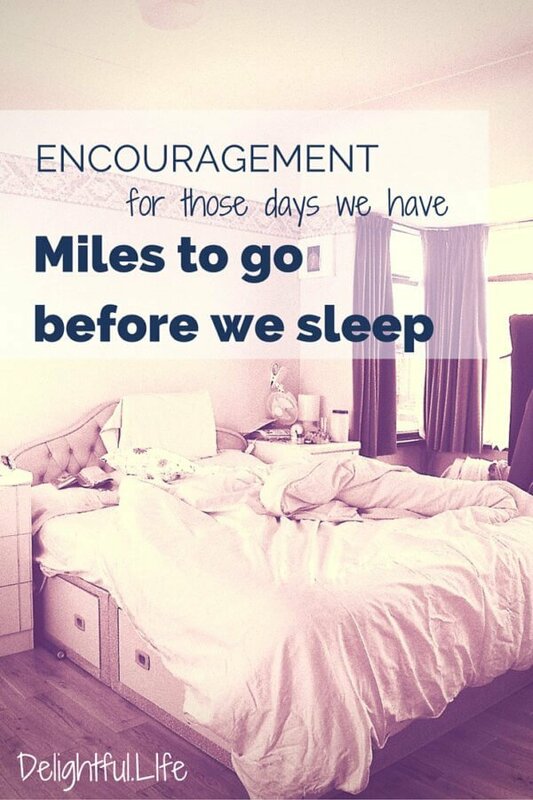 Miles to go before sleep - encouragement on the hard days. My girls had been testing every possible limit, treating one another with anything but love and treating me with anything but respect. The puppy was on her worst behavior too, which – while I know there’s little of eternal value at stake in her training – is exhausting. The baby wasn’t misbehaving, but he is sick again and was incredibly needy. I’m ok with that, but it too can be draining amidst the chaos. After a late run and a shower, I took a quick assessment of what I needed to do still for the day; I realized I had miles to go before I slept. My husband is busy with something very important for work so I have little physical support at home and, more discouraging, I am constantly at a loss of how to support him. I retreated downstairs to be alone, even if my alone time looked a lot like cleaning the kitchen. Some of my favorite songs on in the background, I wiped counters and washed dishes with tears streaming down my face. “Lord, where is this coming from? I know it’s not from you. I’m ambushed in the middle of such momentum, such great things happening, by these same crushing thoughts of worthlessness.” I found myself calling out in desperation as – seemingly out of nowhere – I couldn’t feel him anymore. I couldn’t feel anything anymore except dread. How am I ever going to make anything of my life if the role I’m most called to, that of a wife and mother, I really just can’t do? Why in the world would I think I can work on anything else that might make a difference when I can’t keep my head above water in any aspect at all? Why can’t I even complete the thing I set out to do two weeks ago? I’m already failing that too, and it wasn’t a lofty goal. I found myself once again in the place I fear the most. Of course I know the answer to why these things happen at these times, but if you suffer from some of the same problems as I do, you already know that “knowing” alone isn’t a sufficient coping skill. So I cried. Eventually, I felt more exhausted and not even a little bit better – but it was time to move on. I took a little bit of solace knowing that when I had reached out, I had found friends praying for me. That would have to do. As I finally made my way upstairs for the night I checked on each of the kids. Nolan very clearly needed his diaper changed, so I did so – and held him for a bit afterward; in a rare moment, he didn’t wake up despite being bothered. How quickly my tiny baby boy has grown to fill my lap, I thought. I usually just peek in on each of them, but tonight I felt the urge to spend more time. In Avery’s room I lay with her and prayed: God, please help keep her from some of the things I’ve struggled with for so long – despite that she’s my spitting image physically and emotionally. Anxiety, embarrassment and self-consciousness, fear, over-analyzing and critical thoughts that no 5-year-old should have. Lord, please protect her little mind and heart. Give me wisdom to guide her even while I’m still learning so much about who you’ve made us to be. My prayer in Elise’s room was as different as their personalities. I prayed fervently for grace with this one, who lives with reckless abandon and struggles to hear or pay attention to anything or anyone. The one with whom I fought incessantly today… but then snuggled with before bed, where she asked me to tell her a story from the Bible. As I had told her of Jesus welcoming the little children – that they weren’t a burden to him, but that grown ups should be more like them in some ways – I felt overwhelmed with guilt. I don’t sit nearly enough and just breathe these precious miracles in, thankful for the opportunity to call them mine. I lay in my own bed at last, fearful of the next day. I barely made it through this one and felt the too-familiar downward spiral of depression and distress looming. I can’t do it all again, right? But I will. And I will do my best to remember what a blessing these long days are because the years are so short – and these kids should never, ever feel like a burden. As for me? I will seek the encouragement of community, and in case that doesn’t work (and because this always will), I’ll try desperately to combat negative feelings with truth. All day long, if I must. So… am I alone? Ever feel like you just can’t do it? Previous Post: « I am a runner. Right there with you this morning Jennifer and at 10:30am, I got a shower and talked with God. But…at 10:45am still disliplining M1, in hopes it will stick this time! We all know it probably won’t, praying for the both of us! M1 – so cute 🙂 Thanks for the encouragement Steph… love you! You are ABSOLUTELY not alone in this! I know just how you feel and so many of us do. God’s grace is right there for moms like us every day. Be blessed today, girlfriend! Ahh, yes. I need His grace always. Thanks for stopping by! Kim, I loved reading every word of this comment. I’m so encouraged (for both Avery and myself) to read from your perspective a bit farther down the road. No, no, not alone in a single thing you wrote. One of those times I can readily say ‘been there, done that.’ Your prayer for Avery brought tears to my eyes because it hits so close to home. I wonder how you are able to publicly ‘expose’ your most inner vulnerabilities? Surely, that is a blessing for all those who have, do, or perhaps even will go through some of those what-feels-like-at-the-time crippling feelings you just shared. I can honestly say that it gets better. From a child who suffered tremendously- to the point of biting herself in self-anger and frustration- to finally an adult who can very often simply ‘leave it to God’- to truly just deeply understand that whatever test there is going to be is going to be, and to realize that it’s to make my soul a better one. I must need the practice for whatever is presently dogging me. For me, often times it is patience and letting go of trying to control things around me. We all have our weaker/broken parts to mend and God gives us ample practice to fix them! 🙂 We all love you just the way you are though. That you can count on! What a beautiful picture of what real life looks like. Thanks for sharing this with all of us! I hear you loud and clear. Beautiful. Excellent. Thank you for writing. I nodded and “yes’d” and “amen’ed” my way through this. Your day has so many days been mine. I’ve stood in the kitchen and knelt next to sleeping boys and cried the same tears as you, my sister. And some how, even on the days when I am most sure that we aren’t gonna make it through, we do. Grace. It is always and only all grace. “It is always and only grace.” So true! If all you do on any given day is to do just one thing, do that one thing and be glad in it. One time, a bit ago when I had these same thoughts of depression and fretted over my daily list of not getting things done my father told me that saying. Oh how it changed the view of my challenges! Now with different challenges, my mind sometimes gets the best of me. However I now can rely on these words, my medicine and the process I try to keep in place when it all seems to get out of control. Sharen, I loved these words! It’s true that sometimes we take medicine, power through the routines we have in place as safeguards, and eventually come through the other side. I like to (have to?) think that’s ok! Amen. I have so been there so many times. What would we do without the grace of God some days? Considering *with* the grace of God I still feel like I barely make it sometimes? No idea. 🙂 Thanks for reading! Jennifer, so sorry you struggle greatly with fears, anxiety and lacking self esteem. Makes me sad because I wonder how we could’ve helped you with these feelings as you were growing up. Most days I go through the motions of life without even thinking about what is going on at the time. Unfortunately that is true of parenting my girls. Living each day and dealing with that but not thinking beyond what was going on at that time. I think it’s great that you see in the girls personalities potential problems. Pray every day for your children. That is another thing I wish I had been better about. I would love to have been able to hear that my kids remember me praying for them each night. We have all had those moments where we need to get away from our kids. Misbehaving children and pets can drain us completely. I hope today you were not feeling as defeated because I certainly wouldn’t have helped telling you about my evening. I had not read your blog or I wouldn’t have said anything. You are a wonderful mother who has a lot on her plate and trying to do it all perfectly. I pray you will daily surrender your life and days agenda to The Lord knowing that whatever does or doesn’t happen will then be on His shoulders and not yours. Keep your eyes on the the One who holds all your tomorrows in His hands. You are loved with an everlasting love. Be of good cheer for you are making a difference in many lives! I love you! Thank you for the encouragement. I was feeling ok yesterday but certainly didn’t mind hearing about your night – I felt bad, because I could obviously sympathize! I too don’t pray intentionally nearly enough for my kids; I wish it crossed my mind more. I’m so grateful for you and Daddy!